A decision by the High Court in Nelson on Friday has confirmed the legality of new rules surrounding national pest control methods. The Brook Valley Community Group in Nelson had legally challenged national regulations for pest control, in response to a planned drop of 24 tonnes of brodifacoum-laced bait over the Brook Waimarama Sanctuary. The Group had challenged the legality of the Resource Management (Exemption) Regulations 2017, which purport to exempt aerial drops of 1080 and Brodifacoum from usual resource consent requirements. It had asked Nelson Council to assess the combination of section 13 of the Resource Management Act and the freshwater rules in the Nelson Resource Management Plan, which prohibit the deposition of toxic substances in or on or under the bed or bank of a river. Nelson lawyer Sue Grey, who was acting on behalf of the Brook Valley Community Group had previously noted that “the combination of [the RMA s13 and the Nelson resource Management Plan] appear to make the proposed aerial drop of brodifacoum poison baits in, on or under the bed or bank of the Brook Stream (or any other any Nelson river) a prohibited activity”. However, Friday’s High Court ruling stated that “the decision to promulgate the regulations for use of brodifacoum, 1080 and rotenone was properly authorised and made under law, in accordance with all required considerations”. The High Court ruling also noted that sustainable management is a “balancing act” between competing interests, such as the well-being of communities against sustaining the potential of resources to meet the needs of future generations. She told Nelson Mail, “the court’s decision “basically nationalises decision-making and takes any right-of-consultation away from communities around New Zealand about how their environment is managed”. 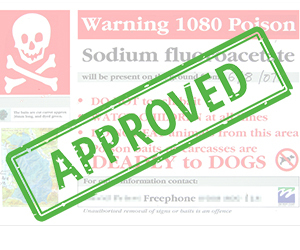 Environment Minister Nick Smith described the ruling as “a significant win for conservation nationally” and that “New Zealanders can have a high degree of confidence in the safeguards on the use of poisons like 1080 and brodifacoum”.